There is clear potential for Canadian businesses to boost their exports; Canada already exports to TPP members, however the key catalyst will be the reduction of tariffs in member countries. A likely loser in this agreement will be Canada’s protected Dairy Supply Management System. To offset this, the government has promised a $4.3-billion investment subsidy spread over 15 years to safeguard current dairy, chicken and egg farmer proceeds – consumers will benefit from TPP manifested as lower prices and more variety. TPP countries in the process will get duty-free access to 3.25% of Canada’s dairy market and 2.1% of its poultry market – not a large portion to give up. Japan will become an important market as they will immediately eliminate the barrier of 32% duty rates on 90% of their agricultural products. Canadian beef and pork producers will be happy under TPP as Japan is eliminating its tariffs within 10 years on a wide range of pork products, while the current 50% tariff on beef will be reduced to 9% within 15 years. Similar to Japan, Vietnam exports will be an opportunity, with a fast track elimination of tariffs of up to 31% on fresh and frozen beef within two years. Automotive origin rules will change, 45% of a vehicle’s content will originate from Canada to qualify under the TPP, a change from NAFTA requiring 62.5% of a vehicle’s content today. Canada’s current rate of 6.1% duty on cars will be phased out over 5 years, and the current US 2.5% duty will be phased out over 25 years for TPP originating goods. All 12 Parties have agreed on a single set of rules of origin that define whether a good is ‘originating’ and eligible for TPP preferential tariff benefits. TPP provides for ‘accumulation,’ meaning inputs from one TPP member are treated the same as materials from other TPP members, if used to produce a product in any TPP Country – anticipate a certificate of origin similar to NAFTA. Once TPP is ratified it’s thought NAFTA will sunset, however with countries expecting challenges with their own country consent processes we can expect NAFTA to be around for a while yet. 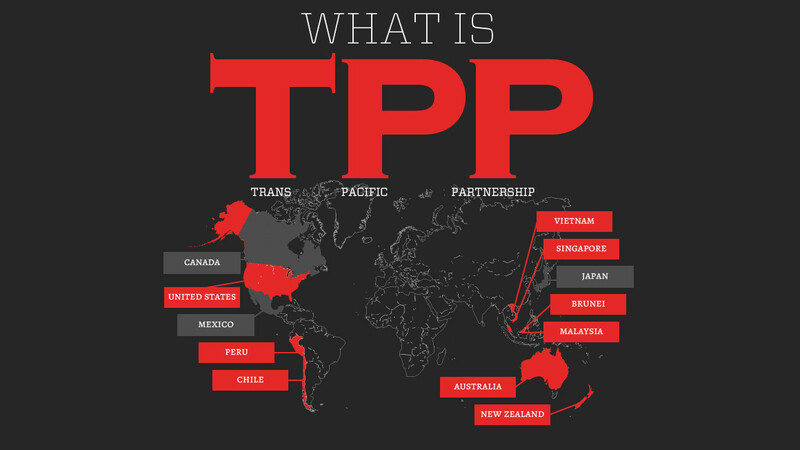 The twelve countries who encompass the TPP are: Australia, Brunei, Canada, Chile, Japan, Malaysia, Mexico, New Zealand, Peru, Singapore, the United States and Vietnam.